So, fellow gamers; I bet you're asking yourselves, "But Sean, given what we now know of this BunnyLord character, what do we do in this game as the anti-hero hero?" Well that answer is fairly simple (or at least simple-sounding): to unreasonably use reasonable force in a sweet mix of run-and-gun gameplay and cover-based shootouts. NAH's intuitive quick-snap cover system allows you to slide, roll, ... more. In an echo from beyond the Veil, Phoenix Online Publishing and The Game Kitchen sent forth an unworldly and non-Euclidean announcement that the hit indie point-and-click horror adventure The Last Door Season 2 Collector’s Edition released today for PC, Mac, and Linux. The sequel to Season 1’s “love letter to Lovecraft”, the new 4 episode collection of the low-res graphics, high suspense ho... more. 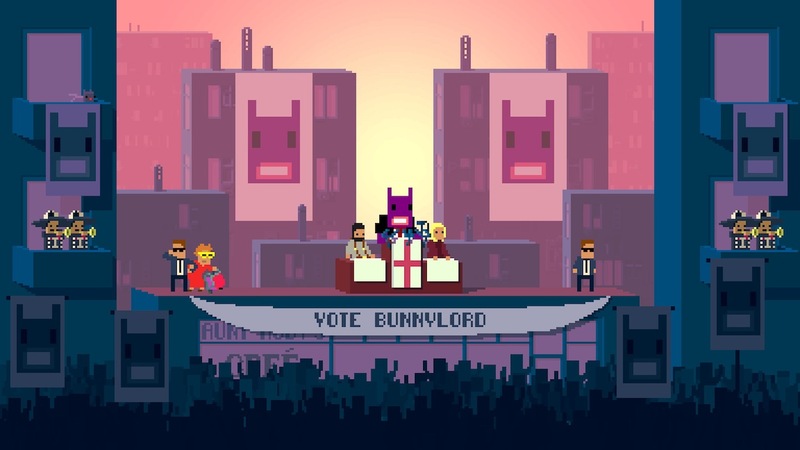 Campaign Headquarters – Political satire shooter Not A Hero is now available on the PlayStation 4 for $12.99 from the political scientists of Roll7 (OlliOlli) and video game industry super PAC Devolver Digital. Harnessing unprecedented superior bleeding-edge and paradigm shifting technology, Not A Hero is powered by ISO-Slant, a new proprietary technology that allows game developers to reach ... more. South African video game developer Free Lives and flag-waving label Devolver Digital have updated Broforce, the world's premiere Freedom SimulatorT, with an obscene amount of free post-launch content - a glorious First Amendment to the main game's treasured Constitution. The latest update to Broforce includes two new lightning wielding bros of Lambertian origin, the immortal Brolander and thund... more.